Take on the morning chaos with a head start on your daily essentials. With ingredients made from real plant-based foods, minerals and essential vitamins made from real fruits and vegetables. Vega® Essentials Nutritional Powder gives you the nutritional building blocks to start your day strong - One less thing to think about? Now that’s worth celebrating! Shake, blend or bake Vega Essentials and enjoy anytime of the day. *At Vega, clean means non-GMO, suitable for vegetarians and vegans, gluten-free, and non-dairy ingredients. Pea protein (64%), Flaxseed powder (12%), Pea starch, Stabilizers (Acacia gum, Xanthan gum), Fruit and vegetable powder (3.4%) (Broccoli, Carrot, Kale, Acerola, Spinach, Beetroot, Tomato, Apple, Cranberry, Pomegranate, Orange, Grape, Strawberry in varying proportions), Hemp protein (2.9%), Natural vanilla flavouring with other natural flavourings, Inulin, Quinoa powder, Marine algae, Sweetener (Steviol glycosides), Spirulina, Sea salt, Pineapple bromelain, Natural flavouring, Antioxidant (Alpha-tocopherol), Mushroom powder. Produced in a facility that also handles dairy, soy, egg, peanuts, tree nuts and mustard. Do not use if seal is broken at purchase. After opening, close lid tightly and store in a cool, dry place away from direct light. Product contains silica packet to maintain product freshness and is not suited for consumption. Best before: see the bottom of the tub. 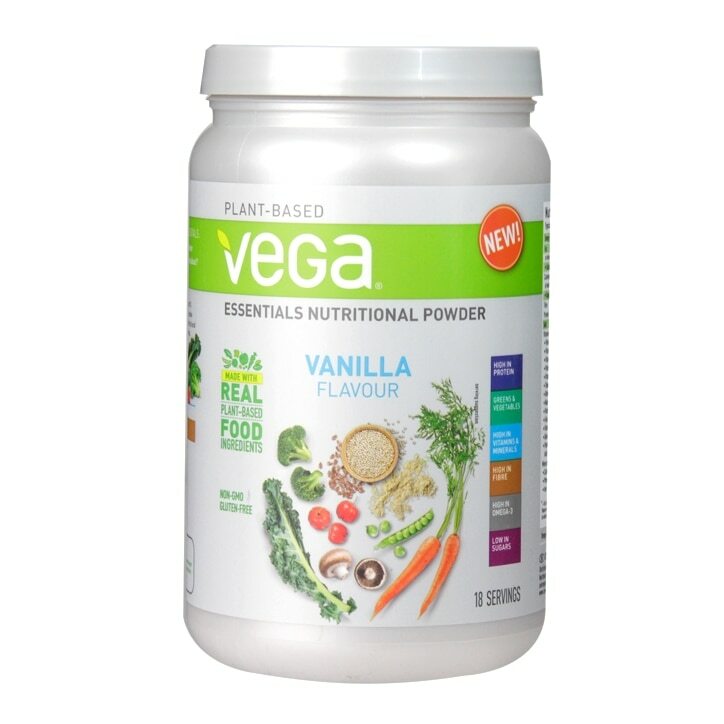 Vega Essentials Nutritional Powder Vanilla is rated 4.3 out of 5 by 41.